The exhibition is at the Mall Galleries in central London. It's open from 31 January to 17 February 2018, 10am to 5pm (closes 1pm on final day) - and admission is FREE. The Columbia Threadneedle Prize website has a new design for the 2018 prize which I will review on Wednesday. An innovation for 2018 is the publication of a virtual exhibition of the selected artwork where you can browse before the exhibition opens. Over 4,000 people submitted digital applications and images of their artwork for the Columbia Threadneedle Prize 2018. Nearly 700 were invited to submit their artwork for review in person by the Panel of Selectors. Just 104 artworks were selected. this is approximately 2.5% of the total entries. The latter is not dissimilar to the success rate of those submitting to the BP Portrait Award. The number of artists selected is an even lower number of 95 artists as 8 artists have had more than one work selected. I think they've done a good job of giving us a good variety of styles of figurative and representational art - and a wide variety of subject matter. Although I detect a few sub-themes coming through - I have started to wonder if we are going to have a corner with very large paintings of architectural subjects! Might be rather nice! It doesn't say so on the website but Lewis told me before Christmas that the shortlisted artists won't be announced until later. I forget whether it's when the Exhibition opens or just before the Awards Dinner. Anyway - I'll be doing another blog post when the shortlisted artists names are announced. It's good fun in the meantime to see if you can spot those likely to be shortlisted! Below are mini profiles of the artists. Links to the artists' websites are embedded in their names. I lecture on artist statements and CVs and develop the mini artist profiles below in a very short space of time from the information provided on websites. Hence they they come with hints and tips for some! I sometimes feel by the end of what follows that I should be giving out an award for "best website" and "easiest to see who you are and what you do" website! The main difference for me this time around - apart from the improved websites - is the increase in people exhibiting who live in Europe. I wonder if this will continue post Brexit? Emiko Aida RE - Grew up in Tokyo where she did her first degree. MA Printmaking, Royal College of Art. Now an awardwinning printmaker and painter living in London who is a member of Royal Society of Painter-Printmakers. 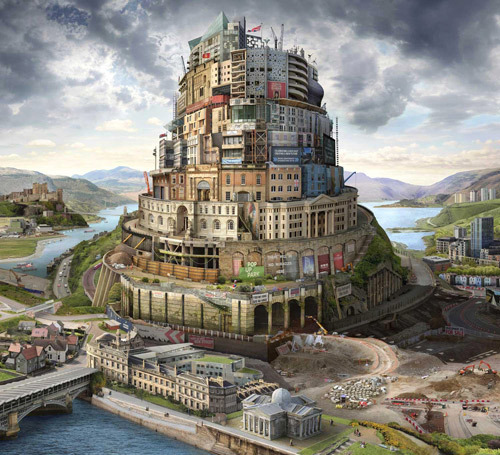 Emily Allchurch - trained as a sculptor, First Class (Hons.) degree in Fine Art from the Kent Institute of Art & Design – Canterbury in 1996, and an MA from the Royal College of Art in 1999. Now uses photography and digital collage to reconstruct Old Master paintings and prints to create contemporary narratives. Her work Babel Britain (After Verhaecht) is a Transparency on bespoke LED lightbox. This is MY TIP for A PRIZE - because there is an explicit nod to art history, it's clever and technically much more than proficient, uses contemporary visual art media and provides an intelligent comment on contemporary society. It's a contemporary figurative artwork with a BIG 'C'. Richard Baker - A very consistent exhibitor who is regularly selected for art competition exhibitions e.g. selected for the The ING Discerning Eye Exhibition for the last 4 years (2014-2017). 2003 - BA (Hons) Fine Art,Leeds Metropolitan University, Leeds. 2016 - MA Creative Practice, Leeds College of Art, Leeds (ongoing). Sarah Ball- born in Yorkshire but lives near Penzance. 1983 - 1986 Newport Art College; 2003 - 2005 MFA, Bath Spa University. Exhibits on a regular basis with solos in Cornwall and group exhibitions in London, Dallas and Hong Kong. One of six shortlisted for the Threadneedle Prize in 2014. Paints people in a stylized way - I find her work vaguely unsettling. Paul Barrand - studied in Liverpool and then Leicester and lived and worked in the region ever since. His artwork has a 'film noir' effect. Deborah Batt (2 works) - Exhibits on a regular basis. Both her paintings - in acrylic and pen on canvas - feature flytipping in monochrome. Bartholomew Beal - Distinction in his Foundation Course and a 1st class honours degree from Wimbledon. Interesting range of exhibitions for his fantasy figurative artwork. In 2014, he was he was the youngest artist to have ever staged a solo exhibition at the gallery at the London Fine Art Society Gallery. Oliver Bedeman - a figurative painter living and working in London, whose work focuses on imagined and often dreamlike portraiture. Degree in Painting at Brighton University, followed by studies at the The Royal Drawing School in London. He's produced a very curious 'look at me' painting. Melanie Bellis - Born in South Yorkshire, London based artist Melanie Bellis draws outdoors at locations in the heart of the city and then develops her drawings into atmospheric etchings. She is a member of the Southbank Printmakers gallery. Frances Borden (2 works) - paints portraits and regularly exhibits an national art society open exhibitions and art competitions. I like both of her paintings. Caroline Burraway - BA in Drawing from Camberwell and an MA from central St Martins. Her work has previously been selected for art competition exhibitions. I like her charcoal drawings but IMO her artist statement needs a radical redraft before I collect it for my examples of "what not to write". Charlie Calder-Potts - a British artist based in Warwickshire who has exhibited in a diverse range of places. She was Official War Artist with the British Army in Afghanistan 2013/14. Her work looks at history and it's repetitive nature; the value of our heritage and our similarities to previous generations and to each other. She has an Arts Council sponsored solo exhibition at the Fosse Gallery in February. I'm very interested to see how she works with Pencil, ink, and gold leaf on vellum calf skin. Looks interesting. Alex Callaway RBSA - Born in Devon, now based near the city of Worcester. 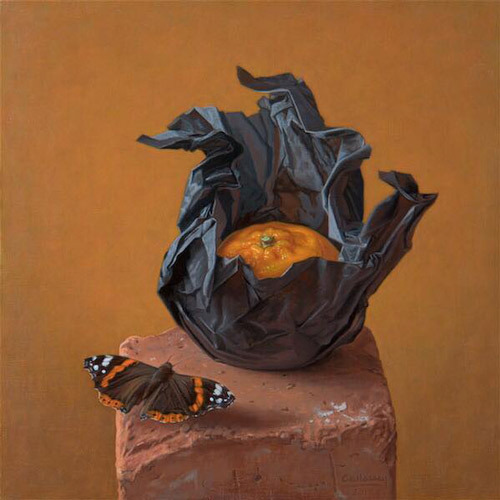 A British contemporary realist painter who was originally a freelance illustrator. Number of awards and distinctions. Samantha Cary (2 works) - I'm afraid I find her website impossible to look at. More artistic statement than method of communication. Enrique Collar - born in Paraguay, naturalized Dutch citizen. Lives and works in Rotterdam, The Netherlands. Amanda Cornish - produces excellent large drawings of nature in charcoal on paper and nails her artist statement in two lines. she documents the unnamed and ignored place, unraveling confused forms to reveal the strange hidden beauty of the overlooked ordinary. Chiara Criniti - an Italian artist and illustrator based in Southern Italy. Studied Stage Design at the Academy of Fine Arts in Lecce. Her work has featured in a number of books, magazines and journals. Serena Curmi - Graduated from Falmouth. Works as a full time artist at Jamaica Street Studios in Bristol after an earlier career as an illustrator. Regular exhibitor at Affordable Art shows in London and Bristol. Paul Dodgson - Paul Dodgson uses natural materials and humour to tell tragicomic stories about people doing things. Born in Manchester and lives in Stockport. 1994 - MA Sculpture from the Royal College of Art. Worked as Senior Technician at the Whitworth Art Gallery, University of Manchester since 2001 and was a Lecturer in Fine Art Sculpture, BA Fine Art at the University Centre Blackburn from 2001 to 2013. Thomas Doran - Foudnation at Wimbledon and BA in Painting at West Surrey. Selected for Threadneedle Prize Exhibition in 2008, 2009, 2010, 2012 and 2016 and shortlisted for First Prize in 2010. Pictures tend to be small, around postcard size, and he mostly works in oil on wood panel. Greg Eason - 2006 - 2009 Norwich University College of The Arts. London-based artist whose work deals with a formal and conceptual dissection of space. His work is often built with pencil and strong narrative elements. Timothy Gatenby - a London based oil painter, originally from Stratford-upon-Avon. Studied film at Queen Mary University then pursued the rigorous atelier programme at Charles Cecil Studios, Florence. Exhibits in groups shows in London. Sarah Gwyer - born in Gloucestershire; now lives and works in the Cotswolds producing contemporary pop art. Studied Fine Art in Cardiff, followed by a Masters in Printmaking at the University of the Arts in London. Her "Amy Remixed" - an Amy Winehouse sculpture in beads - was a big hit at last summer's RA Summer Exhibition. Particularly pleased as this image has represented a significant change of direction for me and it feels good to be validated. Bess Harding - a London-based self-taught artist and illustrator who has been painting in oils for about a year - proving that it's perfectly possible for those who are new to a medium to make an impression and get selected for this exhibition. Plus she has a nice website with an interesting use of Pinterest. Emma Haworth - Master of Arts in Fine Art & Drawing Practice (Wimbledon) in addition to a BA (Hons) Fine Art (Surrey). 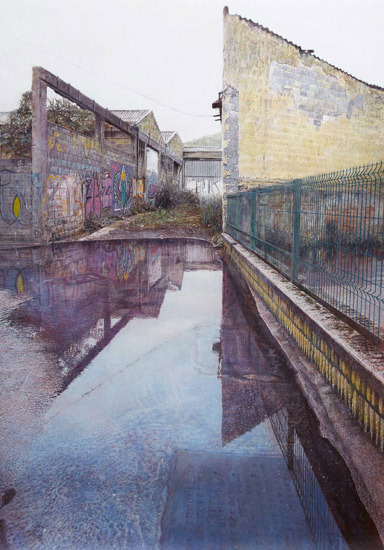 In 2010, she won both the Sunday Times Watercolour Competition (See Emma Haworth wins Sunday Times Watercolour Competition 2010) and the National Open Art Competition. Her paintings are narratives usually set in a park or green area (havens) within a city - and appear frequently in art competition exhibitions. She has a solo show 'My bright new boots' at the Rebecca Hossack Gallery in London (1 -24 Feb 2018). Simon Head - Lives and works in London. He's now an artist after a variety of other occupations. Elspeth Henderson - Foundation in Art and Design (Wimbledon); MA in Medieval History (King's) followed by The Drawing Year at the Prince's now the Royal Drawing School. She's produced an intriguing top down painting entitled The drink before the flight! Morna Hinton - BA in History of Art, a PGCE in Art and an MA in Museum Studies undertaken while working at the V&A. Currently doing a Masters in Fine Art at Wimbledon College of Arts, part of the University of the Arts London. 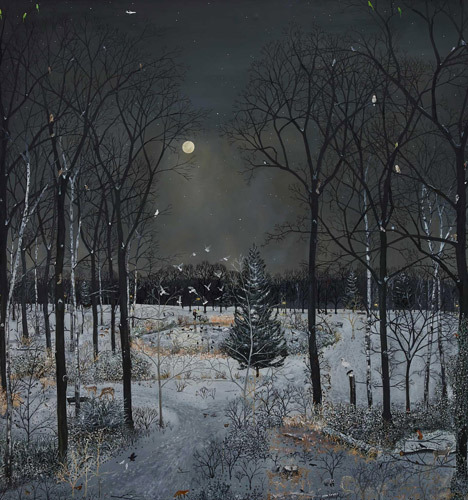 ​ Her painting is called Shed and is one of a series of paintings of winter following the sudden death of her husband during a very cold winter 4 years ago. Noel Hoare - When I saw his painting (without title or details) I wondered whether Rose Wylie had entered! Chris Jones - two artists with the same name, neither of whom seem to work in the same way as the artwork in the exhibition! The NEAC Annual Exhibition 2016 at the Mall Galleries. I particularly liked Coastal Path by Dominic Keshavarz. The skill and technique employed in creating the tonal and spatial depth in what is a very complex drawing is very impressive. To do this using pen and ink is even more reason to stop and look and linger and look again. I've seen a lot of very fine pen and ink drawings and this artist is up there with some of the best when it comes to an interpretation of realism. Henry Kondracki - Scottish artist based in Edinburgh. Studied at the Slade School of Fine Art, London (1986). Received the Cheltenham Drawing Prize (1999), the Hunting Art Prize (2004) and has twice been the recipient of the Slade Fine Art Prize. Work has been widely exhibited in the UK and abroad. No website - link is to gallery. Mario Lafirenze - Lots of illustration sites for ebooks about cat art but no website for painting. Carl Laubin (2 works) - a British/American artist, born in New York. Studied architecture at Cornell University; moved to London in 1973 and becoming a British citizen in 2000. Best known for architectural capricci - paintings of an architectural fantasy, placing together buildings, archaeological ruins and other architectural elements in fictional and often fantastical combinations. He's got one of his paintings priced at £100,00 - of which more comment tomorrow. Cathy Lewis - Studied at Glasgow School of Art , Falmouth Art School and University of the West of England. Works from a studio on Spike Island. Says very little about her work on her website which is a pity. Donald Macdonald - trained at Aberdeen. After living and painting in Denmark and Glasgow he has returned to the Isle of Lewis to live and paint. Susie MacMurray - British artist whose work includes drawing, sculpture and architectural installations. She retrained as an artist after being a classical musician, graduating with an MA in Fine Art in 2001. Lives in Manchester. Exhibits internationally, showing regularly in the USA and Europe as well as the UK. I've never come across anybody who makes art out of reclaimed barbed wire before. Graham Martin - a Scottish artist who studied at Edinburgh, based in London. He is interested in architecture and the built environment, in particular the rapidly changing landscape of East London. Bryden McD - no website. Is this a pseudonym? Apparently "Bricks, plywood, inks, acrylic and textured paint, neon lights, flame retardant putty, Ayrshire grass, accompanying audio track" equate to a value of £10,000. I do so hope the artworks with audio tracks are taking turns in a gallery all to themselves and not inflicting audio on the quiet enjoyment of other works! Audio tracks with artwork is rather like music on art websites - a reason to exit very fast for many people. Kate Montgomery - studied The Ruskin School of Drawing & Fine Art, St John's College, Oxford and then MA at Royal College of Art in London. Regular exhibitor in the past at ING Discerning Eye and the RA Summer Exhibition - and previously selected for Threadeedle in 2009. Very interesting artworks with a very distinctive style - focused on women with Real time and space are avoided, permitting personal histories or fiction to be read. #whomademyclothes is a patchwork blanket with 1,138 used clothes labels sewn on. The number of labels is representative of the number of people who died in the Rana Plaza complex, Bangladesh in 2013. Ruth Murray - Studied at Loughborough and Royal College of Art (MA painting 2008). Very distinctive style with great impact which I know I've seen before (Royal Society of Portrait Painters and/or BP Portrait Award?) - and I'm just trying to remember where. I'm expecting her large painting of a simple and yet complex subject to impress and have 'presence' in the gallery. There's a sense of Wyeth about it. Naghmeh Navabi - Born in Iran. Studied graphic design, art, architecture and interior design in Tehran. Moved to London to study photography. Currently studying BA Photography, London College of Communication, University of the Arts London 2015-2018. The faces of the women in a number of works - including the one in the exhibition - are obliterated. Shanti Panchal Hon RBA - Moved from India to work in Britain in 1978. Has a unique and very pleasing approach to watercolour painting which nobody else has yet managed to copy! His colour palette relates to his early years living in Gujerat. I'm very sure his very respectful painting Grenfell Pyre and the Rescued Family - with its emphasis on the importance of also remembering the survivors - will get a LOT of visitor votes given the subject. If he won the Visitors Choice award of £10,000 - determined by the votes of visitors to the exhibition - I wouldn't be in the least surprised. I was shocked to see the sight of Grenfell Tower the next day, it was still burning. I met a family who were so lucky to be alive as they were rescued by the firefighter. Tim Patrick (2 works) - a painter interested in memory and reality. Studied at the Charles Cecil Studios, 1st class honours in BA Painting (Brighton 2013) before completing his studies at the Royal Drawing School (2016). He won the Leathersellers awards at the 203rd Annual Exhibition of Royal Institute of Painters in Water Colours (includes pic). This an interview with him. Both his paintings seem to focus on the geometrics of interiors and floor tiles. Georgia Peskett - Attended Epsom School - Art and Design with a Higher Diploma in Art and Design. She is a painter and printmaker - she paints on silk using oil and makes prints using Intaglio Mezzotint. There's a little bit the look of Gerhard Richter about some of her pieces. Has exhibited at number of art fairs and festivals as well as some of the art competitions. Simon Philpott - Nails his summary in one sentence! Born in Buckinghamshire, trained in Cumbria, and currently living and working in London, Simon is an artist who creates paintings, drawings and collages. 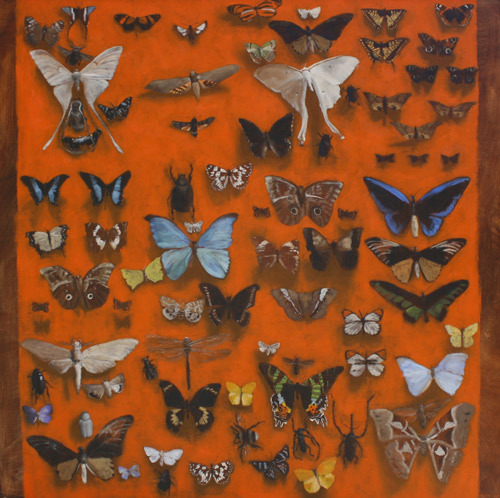 He has also worked for artists such as Damien Hirst and Mat Collishaw and is presently working at Tate. Paintings in oil and acrlyic on birhc ply and uses flat and penetrating colour to highlight his subject matter. Caroline Pool (2 works) - Grew up in Bangkok then moved to England and now lives and works in NorthWest London. Studies included Foundation Diploma in Art & Design at Central St Martin’s, London (2004) and BA (Hons) Illustration degree at Brighton University (2007). Has worked as a set designer on major films but now painting - mainly portraits. Has had two paintings selected - but I like her pencil drawings best. Paul Regan - Has had work exhibited in a number of prestigious art exhibitions in London. In 2016 he was the winner of the Royal Watercolour Award, the Art Gemini Prize and the Cass Art Solo Show Award. Love the summary of who he is (below). He is also the man who paints night paintings of London streets with luminescent windows - which draw the eye. Plus he's also Managing Director of Insight School of Art, a small independent art school in Whetstone, North London. Paul paints the things he notices whilst walking the dog near his North London suburban home. Chris Rigby - has a domain name but website refuses to open for a very long time. Studied art in Lancashire and Falmouth. Over 20 solo exhibitions across the UK since 1999. Won some awards. Believes in getting out in the elements to paint. Gill Rocca - Impressive website in terms of technology, design, content and text. (uses opengraph and Squarespace). A London based artist recognised for her contemporary landscape paintings in oil. Born in Lancashire; studied BA Fine Art at Leeds (1994) and MA Fine Art at Winchester School of Art's Studios in Barcelona. (1996). Has work in major corporate collections. Previously selected for Threadneedle in 2012, 2013 and 2014. Alex Rooney - Born, lives and paints portraits and objects in London. Studied drawing in Italy. Has exhibited in various group shows, including those of The Royal Society of Portrait Painters, The Royal Society of British Artists, Lynn Painter-Stainers Prize and The Discerning Eye Prize. Jamie Routley - Born in Wales and lives in London. Graduated in Illustration from Swindon College. Studied with Charles H. Cecil in Florence, Italy in 2004. Won the BP Young Artist of the Year Award in 2012. Selected for the BP in 2013. Won the de Laszlo Foundation Award for excellence at the RSPP Exhibition in 2017. Nicolas Sage - (Website in French) Born near Paris. Painter, architect and engraver. Trained at the School of Architecture of Paris-Belleville. Usually exhibits only in France. Ana Schmidt - (Website in Spanish) born in Germany, her family moved to Vietnam and then Thailand before her sixth birthday. major in architecture and enrolled at the acclaimed Polytechnic University of Barcelona, ​​Spain. Realistic painter who presents reality without an obvious style or embellishment. Uses sketches and painting from life + photographs and colour and composition studies. Every time I look at her painting I like it. I'll be very interested to see what it looks like in the gallery. Take a look at more of her paintings - I find them very impressive. Melissa Scott-Miller NEAC RP - Melissa is a perennial exhibitor and award winner in the major art competitions. I've also seen this view before a number of times - but I never tire of it. She describers herself as a Portrait and Urban Landscape Painter - and she always works from life rather than photographs. She's very enthusiastic about streetscapes and that excitement is conveyed in her paintings - which sell very well. Jo Shepherd - Born Bishop’s Stortford. Work with profoundly disabled people several times a week, providing art sessions and also teach occasional life drawing workshops at Watts Gallery Artists village, Compton. 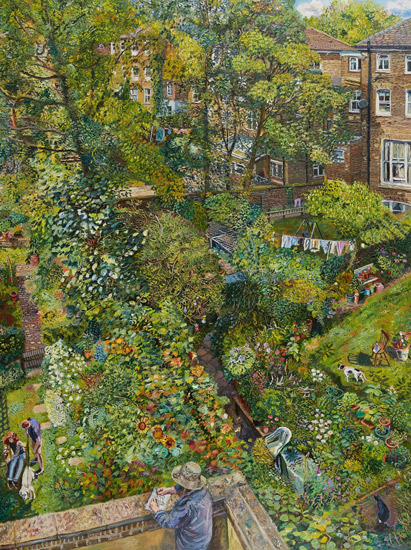 Another version of selected painting was exhibited at the RA Summer Exhibition in 2017. This is the story behind the two paintings. Leos Suchan - (website in Czech) Lives and works in Prague. Studied at Academy of Fine Arts in Prague and the Faculty of Fine Arts, Brno University of Technology. Number of solo and group exhibitions in Prague. His painting is almost an exercise in painting very different textures. Lana Svirejeva-Hopkins - Attended Painting program of the Florence Academy of Art and graduated with degree in Painting from the Edinburgh College of Art. Works as a researcher of Interdisciplinary Creative Practices at Edinburgh CA with a particular interest in the development of expanded forms of portraiture. Tomáš Tichý - A Czech painter who studied at The Academy of Fine Arts in Prague, the Royal Academy of Fine Arts Antwerp. Previously selected for the Threadneedle Exhibition in 2014 and 2016. He has been able to connect well-mastered and thoroughly studied painting techniques with the ability and will to keep searching for and discovering new themes for his paintings. This makes his work part of the general global trend striving to revitalise more-or-less “classical” painting by addressing current topics. Susanne du Toit - Won the BP Portrait Award in 2013. Selected for the Threadneedle Prize exhibition in 2016. Born in Pretoria, South Africa Studies included: BAFA at the University of Pretoria South Africa. MFA at Massachusetts College of Art Boston USA. Polly Townsend - Polly paints mountains and big landscapes. BA University of Wales, Aberystwyth, UK (First Class Honours); MFA Slade School of Fine Art, London, UK; she's won a number of ravel scholarships and has done artist residencies and projects in mountains all over the world (do take a look)- and painted mountains in Kyrgyzstan, Kasmir, Alaska, Norway, China etc. Her work is a painting of trees after fire. A female landscape painter acts like a beacon of hope for life’s rich plethora of weirdos. I have endured harassment (often sexual) numerous times. Shelly Tregoning - born in Mauritius. Spent her early life in the West Indies. Educated in England. Now lives and works in Cornwall. BA in Fine Art at University College, Falmouth in 2011. Selected for the Discerning Eye, the National Open Art Competition, RWA exhibitions and the Threadneedle Prize Exhibition. Lois Wallace - Lois Wallace is a contemporary British Artist. Working with Paint on copper and paper, with galleries in London and Berlin. Trained at the Slade School of Art. Exhibited widely in the UK and abroad. Senior Lecturer in Fine Art at Birmingham School of Art, Birmingham City University until 2017. Gavin Watson - a British painter who works in and from the cultural, political and geographic landscape of rural Northumberland. 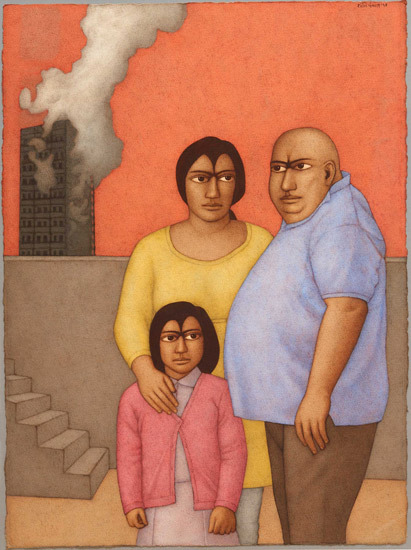 Selected four times for BP Portrait Award in the 90s. Some very punny titles of paintings on his website - some of which I had to think about! You can see more of his very nice doggy paintings here. David Vincent Wheeler - an artist with northern roots and art education at various places in the North East. Urban landscapes in Hyperealism. Has been a regular exhibitor at Lynn Painter-Stainer. His paintings deserve a much better website. Graeme Wilcox - Graduated BA(Hons) Fine Art in Printmaking, Glasgow school of Art (1993). Excellent draughtsmanship and painter. 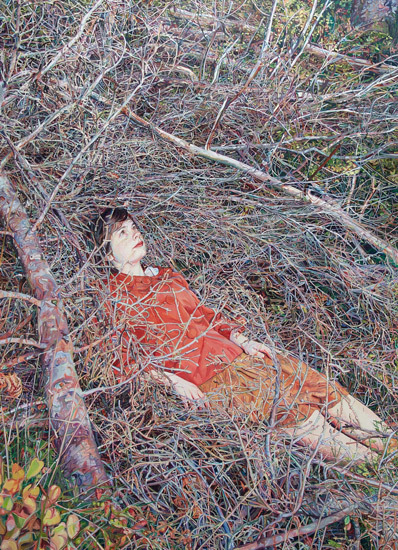 Paints portraits and figures - somewhat isolated from their surroundings. Regular exhibitor at open exhibitions by major art societies in Scotland. Award winner at exhibitions in London and Scotland. His painting Small Protest is a being used as a feature exhibit for marketing the exhibition. I'm guessing that may well means he's shortlisted. Recent paintings depict commuters and people travelling through half-remembered spaces, situations and scenes based upon memories both real and imagined. Susan Angharad Williams - Comes from South Wales. Studied art at both Bath Academy of Art. Also studied at the Royal College of Art under the tutelage of Sir Peter Blake and Donald Hamilton Fraser. During her time at the college she was awarded the ‘Drawing Prize’ and gained a distinction in her degree. This is my blog post about her work Susan Angharad Williams exhibits at ING after she won the iNG Discerning Eye in 2007. I identified a gallery for her that may well be interested in her work - and they were - and she's still with the gallery a decade later! Always paints primarily from life. Agata Wojcieszkiewicz - Grew up in Gdansk in Poland. MA in Fine Art Painting at the Academy of Fine Arts in Gdanks (2011). Now a contemporary artist, living and working on the south coast of England. Time, place and identity are important to me. I am an immigrant stuck in limbo between the past and present worlds, unable to feel at home in my adopted country yet no longer having a sense of belonging in my home country, all at once alienated and anonymous wherever I may be. Wow, thank you for taking the time to look at my website and for the great rundown of all the artists! Sorted! Sorry for the mistake. I do look very carefully for the websites and if I'm not sure generally leave it out.